Thomas J. Saadi, commissioner of the Connecticut Department of Veterans Affairs, led the Nov. 1 event that had been organized by Kate Rabinoff, Arbor Rose resident services coordinator, and Jenna Sweet, Jerome Home life enrichment director and volunteer coordinator. “We are privileged to call these veterans our residents,” Rabinoff said. Saadi noted that families served along with those who “served, fought, suffered and sacrificed in answering their call to duty, honor and country.” When he asked those present to raise their right hand as they did when they took the oath of enlistment, more than half of the 60 people present lifted up their hands once again. “You sacrificed so we can be free. We are so fortunate to honor you,” he said. Julie Norko, regional director, Assisted Living Operations, represented Hartford HealthCare Senior Services, thanking each person for “your selfless service.” She noted that the mission at Arbor Rose and Jerome Home is to help each resident to realize independence, achieve the highest quality of life, and maintain dignity. “We couldn’t do our mission if you hadn’t sacrificed for us,” she said. Norko was presented with an American flag that was flown over the U.S. Capitol this year on D-Day, June 6, a tribute arranged by U.S. Congresswoman Elizabeth Esty who was represented by Sherri Vogt, veterans’ aide in Esty’s office. 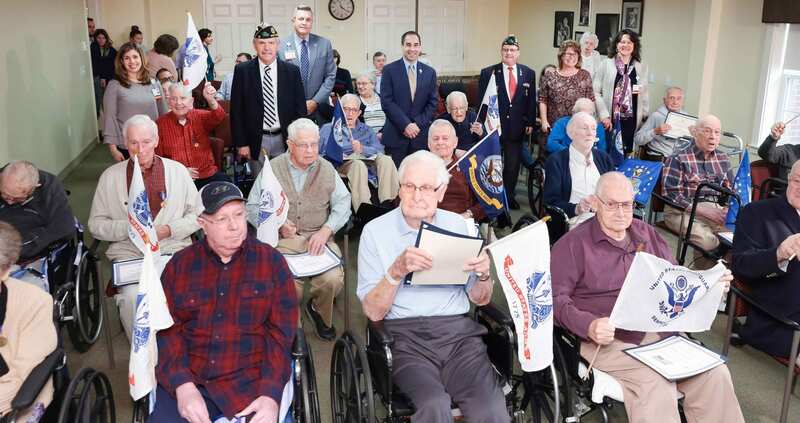 Also playing roles in the morning ceremony were Wayne Rioux, Hartford HealthCare veterans liaison, Ryan McKenna, manager of the Office of Advocacy and Assistance at the Connecticut Department of Veterans Affairs, and officers of the American Legion in West Hartford. Amy Grace Ellison said her father, Bruce Ellison, never spoke of his military service in Korea with the U.S. Army; she had only heard stories from family members. “To see everyone honored, I’m speechless,” she said. U.S. Coast Guard: Earl Carey Sr.
For more information about Hartford HealthCare Senior Services, visit https://hhcseniorservices.org.